Antonio Conte: My heart is always in Italy. Is the Chelsea manager hinting at a return to Serie A? Antonio Conte has been linked with a move back to the Serie A with Inter Milan a possible destination and the former Juventus manager admitted that he will return to Italy at some point in his career. Antonio Conte looks set to win the Premier League title in his first season in charge at Chelsea and the Italian could also do the double should his team defeat Arsenal in the finals of the FA Cup next month. The former Juventus manager has been outstanding since he took charge of Chelsea and Chelsea owner Roman Abramovich is desperate to tie him down to a new long term contract. However, despite Chelsea being on course to win the Premier League title this season and possibly the FA Cup too, there is no guarantee that Conte will remain at Chelsea beyond the current season. Throughout this season, Conte has been linked with a move back to the Serie A with Inter Milan eyeing a move for him as their new Chinese owners are looking to get them back to the top of the Serie A and European football. One thing that's certain is that Conte will not be spending the rest of his managerial career at Chelsea or in the Premier League as the Italian made it clear that he wants to return to Italy at some point in his career. In an interview with an Italian TV show Emigratis, Conte was asked if he would return to Serie A at some point in his career and he said: "Yes. My heart is always in Italy." Check out some of Chelsea's best performances under Antonio Conte so far this season. Then one of the reporters said that no club in Italy will be able afford the wages Chelsea are paying him at the moment to which Conte replied: "Haven't the new owners come in now?" His reply was in reference to Inter Milan and AC Milan who were both recently taken over by Chinese companies. Inter were purchased by Suning Group and have already promised £127 million to spend in the summer to rebuild their squad, while Silvio Berlusconi finally signed off on a majority sale of his AC Milan side after two years of negotiations. During his interview Conte also admitted that he was struggling to adjust to life in England and when asked if he was happy about living in London, he said: "Well..."
The Chelsea hierarchy are yet to come out with a statement regarding Conte's latest comments but it's highly unlikely that the Italian will be allowed to leave the Blues just after one season especially when he could be leading them to the double. 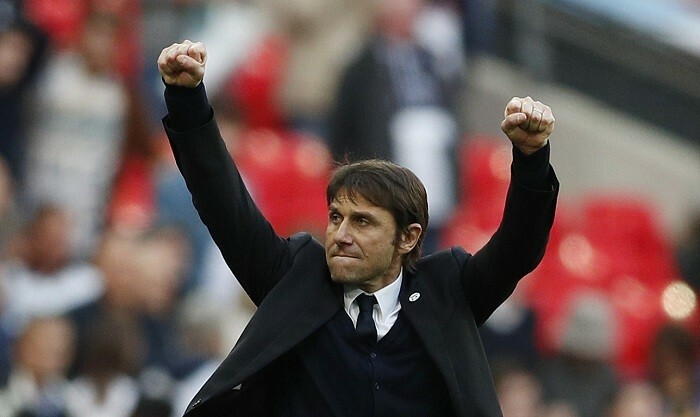 A move back to the Serie A to either Inter Milan or AC Milan or any other Italian club might be on the cards for Conte but not in the near future as the Italian will be looking to win a number of trophies in the coming years with Chelsea.